Paisley opened its doors in 2008 but has been a vision in the mind of Karla Volker, the owner of Paisley Hair Design since she started doing hair in 1999. She always wanted to own a salon and growing up in the area is pleased with Paisley's near downtown location. We are excited to offer a friendly, relaxing environment to slow down the fast pace of daily life. We take pride in our friendly atmosphere and neighborhood style. Our staff has trained under industry leaders TIGI, American Crew, Aveda, Graham Webb, Rusk, GiGi, Goldwell, and many other educators. It is our belief that if we the stylist are informed on new and fresh trends and styles then our clients will be as well. We are conveniently located near the Univ. of Wisconsin campus, in the Regent Neighborhood, at 1941 University Ave. For a map of our location and driving directions from your location, please click here. We hope to see you soon at Paisley. 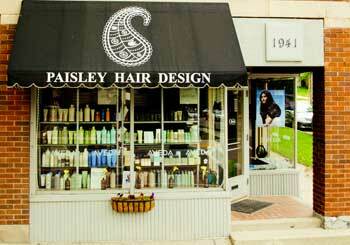 Paisley Hair Design is an Aveda Concept Salon. Aveda’s products are naturally derived from plant based sources. Aveda’s mission is to care for the world we live in, from the products they make, the ways in which they give back to society. They strive to set an example for environmental leadership and responsibility, not just in the world of beauty, but around the world.